1st Century Roman Army History: The Roman legion in imperial times consisted of about 5500 legionaries. The legion itself was divided into ten cohorts. Cohorts 2 to 10 were each of about 500 legionaries whilst the first cohort was larger with some 800 men. Each cohort had it's own standard-bearer or Signifer and a horn-blower or Cornicen, who was used to sound commands to the troops. Each cohort was in turn divided into six smaller tactical units called centuries, each of around 80 men. Each century was commanded by a Centurion (who would be equivalent to an NCO in modern terminology) who was assisted by an Optio, the centurion's second in command. The chief Centurion in the legion was called the Primus Pilus and he would command the first century of the first cohort. Commanding the legion as a whole were six tribunes (drawn from the Equites or wealthy Roman middle-class) who were semi-professional soldiers and usually joined the army as a step on their political careers. Five of the tribunes were called Tribuni angusticlavii and the chief tribune was called the Tribunus laticlavius. The standard bearer for the legion as a whole was the Aquilifer or Eagle-bearer. His office was regarded as sacred and he was seen in a way as the embodiment of the whole legion. The loss of an eagle was regarded as a most shameful event for the entire legion. In overall command of the legion was the legate, usually a trusted senator appointed personally by the emperor himself. 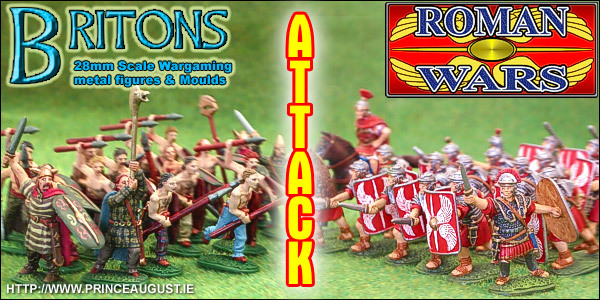 Roman Wars moulds for Legionaries and Ancient Briton Warriors are available here.